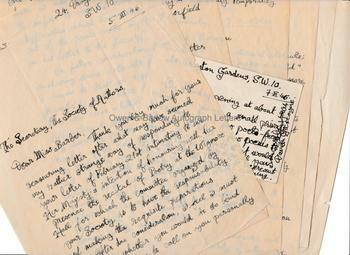 DAVID GASCOYNE Autograph Manuscript and Autograph Letters Signed. English poet associated with the Surrealist movement. 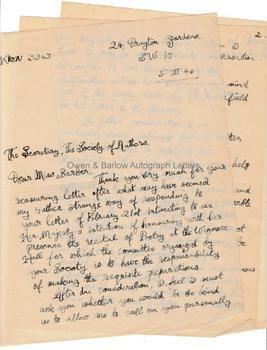 (1) An autograph manuscript by David Gascoyne titled "From Rough Draft of a Letter [to John Masefield]". 4to. 1p. It begins "All true artists are eternal students; any artist of genius is an 'inspired child'. There are as few, and as many, perhaps more in the dramatic profession (to which I belong myself) as there ever where. . ." The manuscript continues for a further 10 lines and then concludes with "The poet is not an antiquary, and does not write for a posterity of antiquarians. . ."
(2) An autograph letter, signed. 4to. 3pp. 24 Drayton Gardens, SW10. 5th March 1946. To the Secretary, the Society of Authors, [Elizabeth] Barber. "Thank you very much for your reassuring letter after what may have seemed my rather strange way of responding to your letter of February 21st intimating to me Her Majesty's intention of honouring with her presence the recital of poetry at the Wigmore Hall for which the committee organised by your Society is to have the responsibility of making the requisite preparations. After due consideration, I feel I must ask you whether you would be so kind as to allow me to call on you personally one day, at your convenience, when I hope I may be able in private conversation to confide to you the nature of the difficulties which have arisen in my mind out of the points made by Dr. Masefield in his letter to the Society. On further consideration, I am enclosing some extracts from a letter I began to draft in reply to Dr. Masefield, in the hope that they may help to make clear a little the kind of difficulties to which I have referred, and my anxiety to avoid offending any possible member of the Committee for whom my perfectly genuine feelings of respect and affectionate loyalty might easily be unlikely to be taken immediately for granted, in the light of my not inconspicuous 'subversive' associations in the pre-war past, which I am committed publicly to renew in the near future in a possibly sensational special number of 'Horizon' for which I shall be assuming temporarily the editorship. Yours sincerely, David Gascoyne." (3) An autograph letter, signed (or autograph note, signed, on post-card). 1p. 24 Drayton Gardens SW10. 7th March 1946. To Miss M. E[lizabeth] Barber. "On Sunday evening at about 9 o'clock, am giving a small private reception for a few poet-friends of mine to read a few poems to some of our friends, it would give us much pleasure if you were able to be present to represent the unread authors of the evening. Sincerely yours, David Gascoyne." 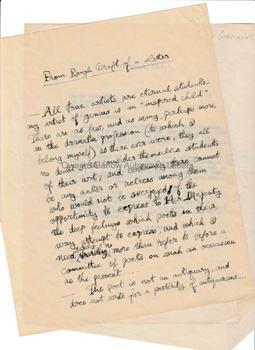 (4) Two carbon copy letters to Gascoyne initialled by Elizabeth Barber concerning the proposed recital. 4to. 2pp. March 1st and March 5th 1946. Gascoyne's letter and its enclosure are somewhat strange documents. The poet Lauriate, John Masefield, had arranged the poetry recital which was to take place in the presence George VI's consort, Queen Elizabeth. The poets who were expected to appear included Walter De La Mare, John Lehmann, Edith Sitwell, Vita Sackville West, Louis MacNeice, Laurence Whistler and George Barker. The recital took place on 13th May 1946 and the stellar affair included a reading of three poems by Gascoyne's friend, Dylan Thomas. Before the war, David Gascoyne had been living in Paris where he was part of the group that included Salvador Dali, Max Ernst and Andre Breton. His poetry at this time reflected his involvement in the Surrealist movement. He played an important role in the first Surrealist Exhibition in London and also translated much of the work of the surrealists for publication in English. Prior to that he had aligned himself with the anti-fascists and had joined the British Communist Party. During the Spanish Civil War he had made anti-fascist radio broadcasts from the Barcelona Propaganda Ministry. It is difficult to know which of these activities Gascoyne is referring to as "subversive" - perhaps all, or perhaps he refers to something else. David Gascoyne had close friendships with many literary and artistic figures of the time, including Dylan Thomas, Lawrence Durrell, Picasso and Henry Miller. He began to suffer emotional and spiritual crises over his homosexuality and, after the war, had begun to use amphetamines and other drugs, which did little to help his mental state. By the date of this letter he was already suffering from depression and was seeking psychiatric help. Eventually, he would be admitted to a psychiatric hospital on the Isle of Wight. This curious letter and its enclosure appear to reflect some of the turmoil that was being experienced by Gascoyne at this time. Given that the rather odd grandiloquence of his longer letter appears to amount to a refusal to take part in the Royal Command recital, his invitation to Barber to attend his private reading does appear something of a snub to the literary establishment. Although several poems and essays by Gascoyne appeared in 'Horizon' from time to time, his 'special issue' under his 'temporary editorship' appears to be a complete descent into fantasy. Provenance: From the personal collection of the late David Mayou, the literary collector and bookseller.